A few days back, I declared this upcoming summer to be a summer of summers. I can't see the future or anything, but I've got a sense about it. It's going to be good. For one, the blockbusters seem to be lining up nicely. Batman and Indiana Jones are making return appearances. So is the Hulk. Iron Man was a blast. And M. Night Shyamalan is releasing some film that links bees dying off to some sort of mass disaster. His stuff is hit or miss, but it could be fun. Secondly, people are going to need fun, so I think people are going to make fun. Rising gas prices are knocking cross-country road trips off the schedule, so more eyes will be turning to hometown events. I predict more barbecues and trips to the park and days at the beach. Classic. Third, I've got a working garden hose and a daughter who's just now mastering the ability to walk. I predict that by mid-June I'll have a kid running around in the sprinklers in my front yard. Nothing says summer more than that. Stick an Otter Pop in her hand, and I'll bet autumn will never come. Or course, this is the Central Coast, so autumn never really comes anyway. 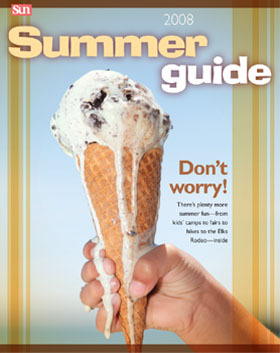 But if none of that convinces you that a summer of summers is at hand, this summer guide might. Our calendar editor spent hours compiling events and activities that stretch from late May to September--there may even be a few October events in there, just for good measure. From stage productions in air-conditioned theaters to outdoor sporting events in all their sweaty glory, this guide has it all. Take your pick of Fourth of July events (if you can, chart a route to hit the best fireworks displays around the coast), and be sure to take the time to schedule old favorites alongside new adventures. Never been to the Melodrama or PCPA or the SLO Little Theatre before? There's a first time for everything, and this summer's when to do it. If you're a perennial hiker, set down your walking stick for a weekend and visit a car show. If you're a night owl, drop by a festival some morning. Or vice versa. Check out the hot acts at local fairs, meet neighbors you never even knew you had at community events, or really stretch your horizons by signing up for a class. On the younger end of the spectrum, check out camps and other activities that will keep kids so busy, they won't even see the start of the next school year coming. They can have fun on a morning-to-morning basis, or take whole series of weeks out of their schedules at once. And don't forget museums. I loved museums when I was a kid. I still do. I would live in a museum if I could. Actually, I would live in an aquarium, but that's really similar to a museum, so it counts the same. Sorry, I'm rambling on a bit. I think I'm just giddy thinking about all the fun stuff there is to do this summer. And I think I'll wrap it up now. I've got to get a jump on my own planning--I don't want to waste a second of this season. After all, summer only comes once a year. Executive Editor Ryan Miller thinks he can remember a year where summer came twice, but he's not totally sure. Send comments to rmiller@santamariasun.com.